These are my latest Gaziano & Girlingbespoke shoes, waiting to be made ready for a fitting (hopefully next week). They are a St James style (semi-brogue adelaide) in vintage cedar. With more variation in this process now at G&G, Tony has introduced more measurements, a pressure-pad system and a trial shoe for customers (below). The first two are both differences I noted at Lee Miller, the Texas bespoke bootmaker, in a recent post, though Tony swears he didn’t see it. Perhaps Daniel did. The trial shoe, or rather pair of shoes, is made out of cheap leather and given a cemented rubber sole. But the shape is exactly the same, so the customer can wear them around for a week or two and get a better idea of how well they fit – as they are walked in, as the foot swells during the day. These changes can be incorporated into the last and mean fewer changes are required on the finished shoe. As I’ve already been wearing my bespoke G&Gs for several months, this isn’t really required for me. But it will be interesting to see how new customers like it. You can follow the discussion on Gaziano & Girling bespoke: new adelaides and fitting process by entering your email address in the box below. You will then receive an email every time a new comment is added. These will also contain a link to a page where you can stop the alerts, and remove all of your related data from the site. Stunning shoes, beautiful colour. May I ask the cost and the turnaround time for these ? The cost is £2900 plus VAT for EU customers, no VAT outside EU. Waiting time currently 6-8 months. Simon, In terms of only fit and comfort how would you compare Cleverley to G&G? Would you ever try JL Paris Bespoke? The two have been very similar in terms of fit and comfort, but the styles are very different. Cleverley uses much thinner leather and soles, unlined interiors – a City shoe. 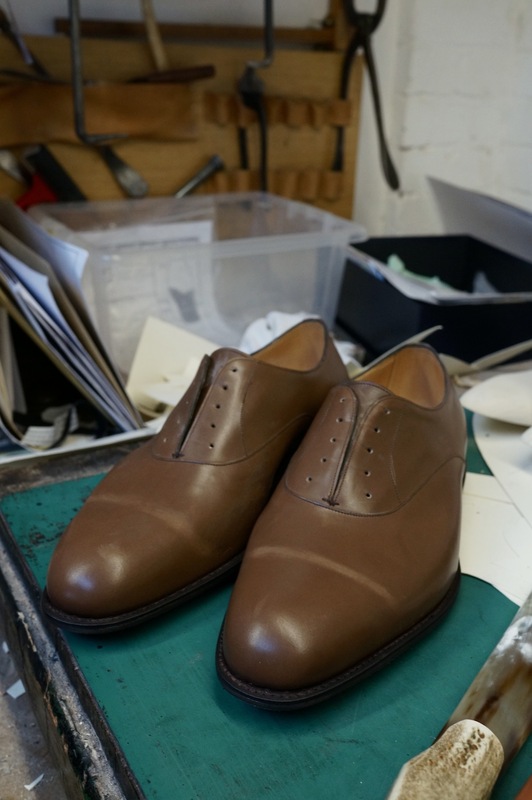 G&G is more of a Northampton shoe – more substantial, but better finishing. In fact I was surprised how big the difference was. Yes, I would certainly try JL Paris. They do great things, if expensive.